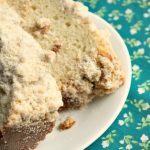 The sour cream in the batter is the key ingredient to this moist and tender recipe for Crock-Pot Crumb Coffeecake. Bake this delicious coffee cake for breakfast, dessert or just to snack on! There is nothing like a generous slice of coffeecake with a cup of coffee (of course) for breakfast in the morning. It honestly is one of my favorite breakfast treats. I don’t have it often because let’s face it, cake is not the most healthiest breakfast option but when I am feeling like a little sweet treat or I am expecting company over for breakfast or brunch a coffeecake is fun to make. 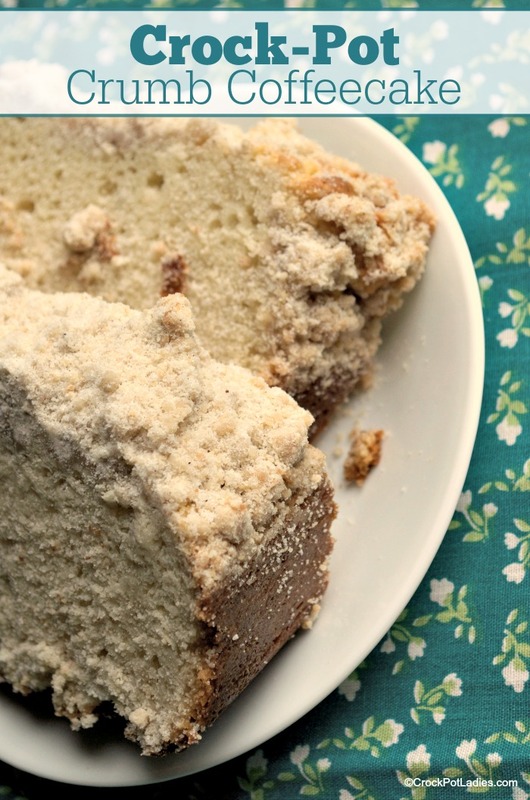 I decided to set out on a mission to make a delicious and easy coffeecake in my slow cooker. After several tries this recipe was the winner. The cake is enriched with sour cream which makes it nice and moist and the crumb topping is just perfect with it’s lovely hint of cinnamon. You can either make this recipe straight in the stoneware insert of a 5 or 6 quart slow cooker but my preferred method is to use a loaf pan that fits inside my oval slow cooker and there is enough batter for 2 batches in a loaf pan. 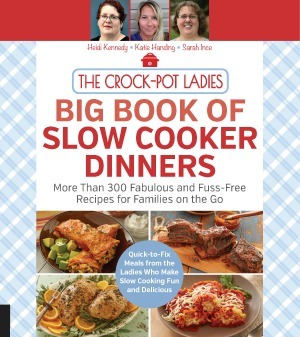 I either cook one, pull it out and cook the other, or because I am a Crock-Pot Lady I use two slow cookers at a time. The cake cooks in the slow cooker for 1 1/2 to 2 hours so you can get up early and have this ready for breakfast. But I personally like to make it the night before. Right after dinner I will whip this up and let it cook. That way I can wrap it up in plastic wrap and let it sit out overnight. I find it actually tastes better the next day. A big cup of your favorite coffee and you have a wonderful sweet breakfast treat. Or serve it for dessert or just as a snack! A wonderful and rich coffeecake that is perfect for breakfast, dessert or just as a snack. Sour cream makes the cake moist and the crumb topping has the perfect touch of cinnamon. In a medium mixing bowl, combine the flour, sugar, salt and cinnamon until mixed. Add the melted butter and vanilla extract. and mix with a fork until the mixture is very crumbly. Set aside. In a large mixing bowl, add the sugar and butter and cream together with a hand mixer. Add eggs one at a time mixing after each one. Add in the vanilla and sour cream, mix well. Add in the dry ingredients all at once and mix until combined. Butter or spray with non-stick cooking spray two loaf pans that fits inside your slow cooker. Add half of the cake batter to each pan. Sprinkle half of the crumb mixture evenly over the top of each cake. Place one loaf pan inside the slow cooker and cover and cook on HIGH for 1 1/2 to 2 hours or until a toothpick inserted in the middle of the cake comes out clean. Remove the first cake from the slow cooker and allow it to cool before serving. Repeat the cooking process with the second cake. Remember, whenever a recipe calls for a cooking range time, always cook for the shortest amount of time given (in this recipe 1 1/2 hours), check the food to see if it is done and then, only cook for the additional time if needed. This recipe was first published in April 2012. And we have decided it was time for an update. New photos, as well as special diet and nutritional information has been added. We hope you enjoy! I am lactose intolerant, any ideas for a sour cream substitute?? If you have issues, even though it will have been cooked. and maybe you could try lactose free yogurt. I can’t guarantee that would work though. I have a daughter who is lactose intolerant..so I sympathize. I am lactose intolerant as well, however I find that dairy in cooked products does not seem to bother me at all. However if you are avoiding dairy altogether I would think you could use applesauce as a replacement for the sour cream. I have a banana bread recipe that calls for sour cream and if I am out I have had luck using applesauce instead. I don’t have a crockpot big enough to fit a pan inside of…. could I bake it in the oven? how long? would I have to alter the ingredients? 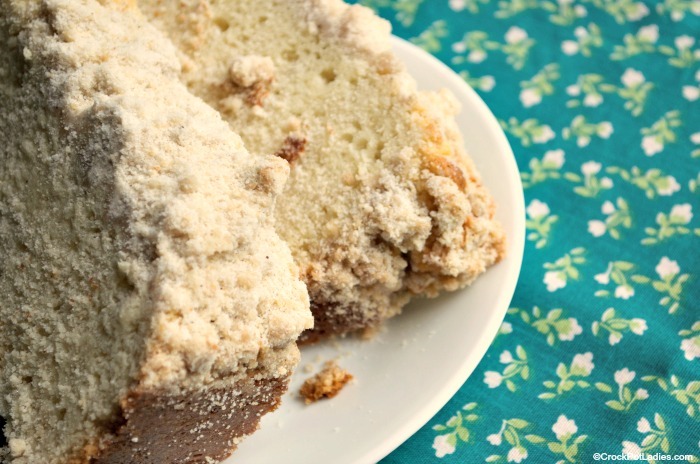 this just looks so tasty and my husband LOVES coffee cake! I have never cooked a this coffee cake in the oven. Doing a basic internet search I am seeing 20 minutes as a common number. And cooking it at 225 degrees. But again, I have never done this before. Let us know if you get an answer! We made this last night – it was wonderful! Thank you!! This recipe was shown on Facebook with a link to this page, but the video shows different instructions and a different coffee cake than the one on this page. Which cake is for this recipe? This is the same recipe as in the video.